Grazing Management Systems adheres to high standards of quality and integrity in all of our operations: we are providing a product and a service built around it that has the proven ability to resolve the most serious threats to the Australian rural economy - declining land performance, salinity and drought, so we take our responsibilities very seriously. We will only dispatch grown seedlings of the highest standards, produced using the best nursery practices currently known. To this end, we will monitor our products during all stages of production and subject them to rigorous final inspection before dispatch. We will continually experiment, learn, study and strive to develop new techniques and procedures that offer real and substantive benefits to out clients (for example, our nursery uses a special cell growing technique ? internally developed - that produces the straightest and strongest possible stems and roots, critical for successful field establishment and on-going grazing performance), as we understand that the proper education is critical to optimal Oldman saltbush application - it makes the difference between acceptable results and outstanding ones. We will not limit our research only to Oldman saltbush, but all other areas of native pasture measurement which can be reasonably expected to have a direct impact on the success of your grazing operation. We will provide you with up to date information as to the most effective ways to improve your use of Oldman saltbush, delivered to you in a manner of your choosing (email, web based, mail or multimedia). 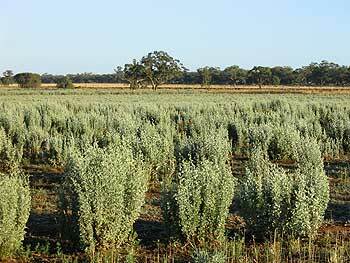 We will continually lobby both Federal and State governments to provide enhanced financial assistance to you in the proper application of Oldman saltbush to resolve the serious national problems of declining land productivity, drought and salinity, along with the serious issues that stem directly from them. We will listen to your ideas: we know that each property and the application of Oldman saltbush on it adds a new element to a unique knowledge base, a base that can help you, us and fellow landowners when it is shared. In recognition of this, we will liaise with you on a regular basis to ensure that future service delivery will be improved by your experiences and ideas. The above is our philosophy. When translated into a more practical level, for you it will mean? On property inspection for your project. Seedlings graded and packed in specialized waxed boxes for the easiest field planting. Free delivery of seedlings (for commercial quantities). Continued on farm grazing management support and advice. As much as you need, as little as you need; Grazing Management Systems is able to deliver the perfect product and level of service for your budget and your requirement, first time, every time, all the time.